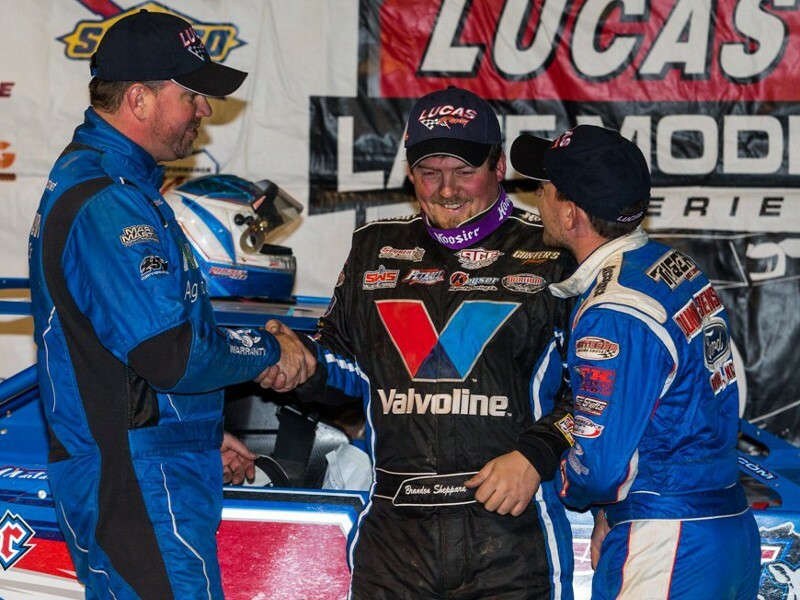 Brandon Sheppard (center) is congratulated by second place Devin Moran (left) and third place Jonathan Davenport (right) after scoring the win in Saturday night's Lucas Oil Late Model Dirt Series Indiana Icebreaker at Brownstown Speedway. BROWNSTOWN, Ind. - Brandon Sheppard denied Devin Moran his first Lucas Oil Late Model Dirt Series win of the season on Saturday night at Indiana’s Brownstown Speedway. By doing so, Sheppard scored his first series victory of the season with his first career win at the historic raceway. Sheppard becomes the fifth different winner on the tour this season after holding off a late-race charge from Devin Moran for the win. Blairsville, Georgia’s Jonathan Davenport finished third, with Hudson O’Neal in fourth and Tyler Erb in fifth. Sheppard made a clean sweep of the night, setting fast time in qualifying and winning the first heat race of the night to earn the pole. Sheppard took the lead at the start of the 50-lap main event with Hudson O’Neal giving chase until the caution for debris on lap 21. On the restart, Moran moved into second and held the runner-up position to the finish. The final caution of the race came with just two laps remaining. Moran and Davenport managed to get within striking distance, but Sheppard forged ahead at the end. Don O’Neal, Josh Richards, Earl Pearson, Jr., Tim McCreadie and Allen Weisser rounded out the top ten. On Friday night, the Lucas Oil Late Model Dirt Series was slated to compete in the Buckeye Spring 50 at Atomic Speedway in Chillicothe, Ohio, but that event was rained out. It has been rescheduled for Thursday, April 11. For more information, visit LucasDirt.com.